Most of our readers know that AccurateShooter.com completed a major site upgrade late last year. But perhaps you haven’t seen all the new features yet. The site has been completely over-hauled and improved, with a larger format, more photos, better search engine, easier navigation, and database-served articles (to help you find related content faster). Visit www.accurateshooter.com, to check out our new home page. There you’ll find a selection of popular articles (that change with each new page visit), a “feed” of our latest Daily Bulletin items, plus links to videos, free targets, free Classified Ads, and of course our popular Cartridge Guides. We just released our latest Featured Gun of the Week Story. 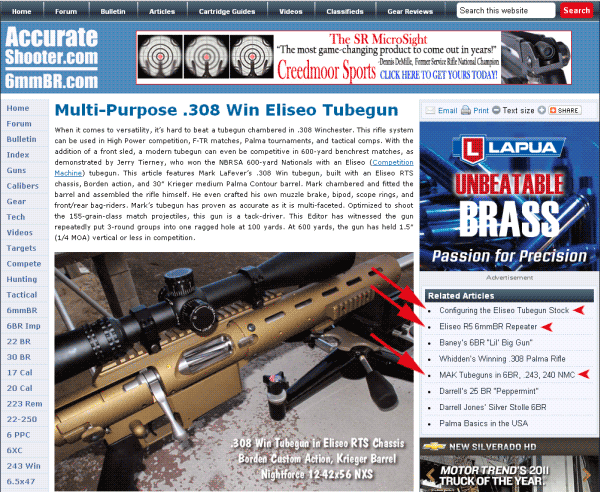 This article spotlights a .308 Win tubegun built with an Eliseo (Competition Machine) RTS Chassis. Mark LaFevers, the gun’s owner, assembled the rifle himself and chambered the barrel. 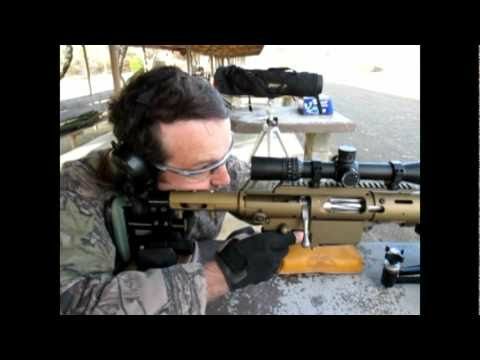 And get this — Mark even built his own bipod, bag-riders, scope rings, and advanced muzzle brake. The story is a “must read” for all Tubegunners and .308 Win fans. CLICK HERE to read the story. For a sample, watch the video below, which features an interview with Tubegun guru Gary Eliseo. This new Tubegun article illustrates some of the cool features of our upgraded website. First, we’ve embedded thumbnail links to related articles within the text. In addition, in the right column you’ll find a set of links to related stories. Just click on the link (as shown by the arrows) to real a new story on a similar topic. This makes it is easy for readers to find interesting, relevant content. All articles are now searchable through a fast search engine. You’ll find a search window at the upper right hand corner of every page in the updated website. Share the post "Read our Latest Feature and Check Out Related Articles"
Set your bookmarks to http://www.accurateshooter.com/forum. If you were registered in our Forum before, you can use the SAME User Name and SAME Password on the new Forum. However, on your first visit to the New Forum you’ll need to log-in TWO TIMES in a row to activate your account. The first log-in captures your name and password, and encrypts the info for higher security. The second log-in will activate your account. Thankfully, most people have figured this out. Note that your password is CASE SENSITIVE now. So, if it was all lower case before, you need to type it exactly that way. When we launched this new Forum we imported over 3500 file attachments (mostly pictures), from the old Forum. That was a very difficult task and we had a few glitches. Now all the attachments are linked up successfully so the attachment feature is live and “open for business”. To attach files to a post you can either upload your image to an image host (such as Photobucket.com) then simply paste the code for the picture into your post. We recommend using a third-party image host for photos, as this will display your pictures full size (or any size you set during upload). But, if you prefer, you can also upload your images as attachments. Your files will then be stored on our server. To upload image attachments, click on the “Additional Options” link below the text box. This will display the attachments option. Click “Choose” to find a file on your computer hard-drive. NOTE: Max file size for an attached file is 150kb so you may have to re-size your images before loading. Once you’ve designated a file attachment, you can add more attachments the same way if you want. Then, when all the attachments are listed, click POST. Your files will be uploaded to our server and will appear in the post as 180-pixel thumbnails. Click on the thumbnail to see the full-size image. Share the post "AccurateShooter Forum Impresses Users with Speed and Features"